1. Preheat the oven to 170'C 15 minutes before its ready for use. 2. Divide the black sesame lotus seed paste into 16equal portions. Roll the divided black sesame lotus seed paste into balls and set aside. 3. Divide the salted egg yolk into 2. Place the egg yolks on a baking sheet and spray with some cooking wine and bake at 120'C for 8 minutes. 4. Insert the half salted egg yolk into a black sesame lotus seed ball and roll into a ball again. 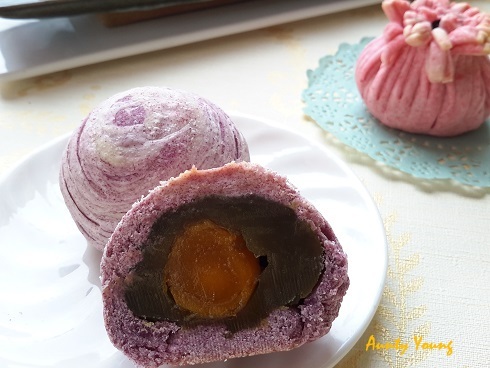 The black sesame lotus seed ball with salted egg yolk will be 25g each. Repeat for the remaining 15 balls. 5. To make the outer layer dough : Mix the flour, shortening, icing sugar and water together. Knead the dough until pliable for about 10 minutes. Cover with a plastic wrap and let rest for 15 minutes. 6. 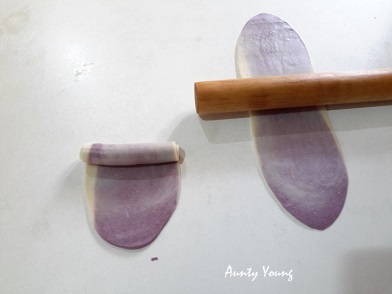 To prepare the flaky dough : Gently mix the cake flour, purple potato powder and shortening together. Shape the flaky dough into a log. Divide the flaky dough into 16 equal portions. Roll each portion into balls. Repeat the same process for the outer layer dough after it has rested. 7. Place one of the outer layer dough ball on one of your palm and lightly press to make a dent. Place the flaky dough ball on the flatten outer layer dough. Bring the outer layer dough together to completely covered the flaky dough and re-roll into a ball. Repeat for the remaining balls. 8. Flatten the combined dough ball with your palm. Use a rolling pin to gently roll out the dough length wise. Use your palm to roll back the dough. Place the seam side up and rest for 10 minutes. 9. Use the rolling pin to roll out the dough length wise the second time. Use your palm to roll back the dough.Place the seam side up and rest for 10 minutes. 10. After resting, cut the dough into 2, use rolling pin roll them into disc. 11. 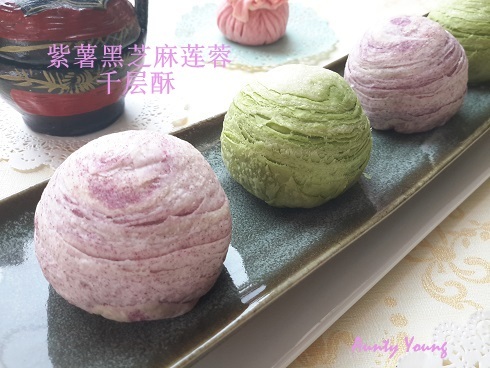 Place a portion of green tea lotus paste filling on the centre of the disc dough( with the cutting part facing outside). Use the thumb and the index finger to slowly gather the dough around the filling, use the thumb of another hand to lightly push in the filing. This way, you will get dough ball with minimum seam. Pinch the seam together and roll into a ball and place the seam side down. Repeat for the remaining balls. 12. Place the dough balls onto a parchment lined baking sheet. Bake in a preheated 170'C oven for 20 – 25 minutes or until golden brown. 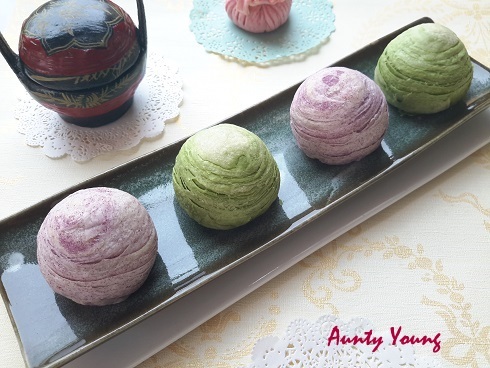 Hi Aunty Young, lovely, flaky mooncakes. Nice colour. 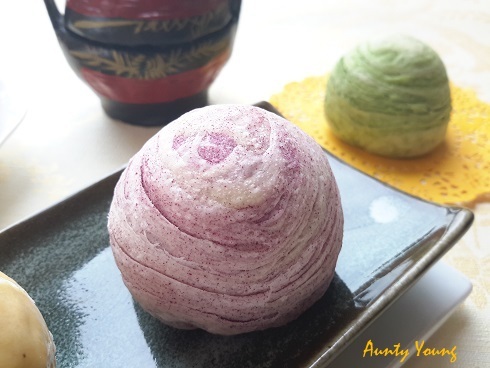 Haven't decide whether to bake more mooncakes but these are quite fast to make, isn't it? Will wait first. I love this flaky skin mooncake. But it seems quite difficult to make. 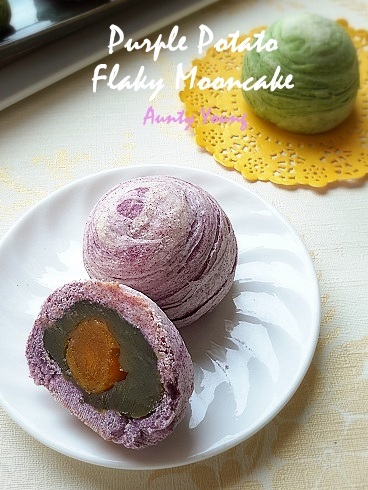 Actuality the flaky skin mooncake is not really difficult to make but a bit more time consuming instead. 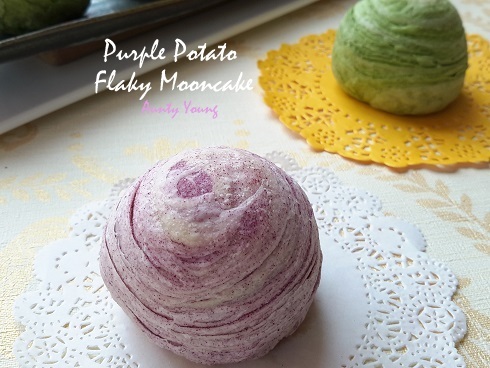 Do try it and share with me your lovely flaky skin mooncake. Where can I buy purple pirate powder ?